To unlock the power of your Kicker Solo-Baric L5 or L7 subwoofers, we have an excellent solution! Our dual 15" enclosures will enable you take full advantage of the output capabilities of your Solo-Baric subwoofers. 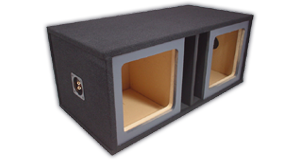 To achieve the absolute maximum bass per watt you merely cannot go wrong by using a custom Kicker enclosure. These boxes are constructed from exact Kicker specification to ensure maximum performance regardless of your musical preference.